Disclosure: I received this product free for review. All opinions remain my own. As I’ve mentioned many times, every family has their favourite style of diaper. I am still very much a pocket diaper fan, so my favourite “style” of all-in-one (AIO) diaper (because there are many styles!) is the kind that still does have a pocket for adding additional inserts if desired. That said, this is not the case for all AIO users, so I’m reviewing this SmartBottoms Organic AIO with that in mind! The composition of the SmartBottoms AIO reminds me of the old-style BumGenius Elementals: the fully cotton-lined inner with a sewn-in cotton insert. However, I see one major improvement on the old Elemental design: the insert is only sewn in on one side, which means a significantly reduced drying time and also the possibility of folding the insert smaller for the lower rises or doubling it up as necessary for extra absorbency. Just because this AIO doesn’t have a pocket doesn’t mean you can’t add extra inserts, either. 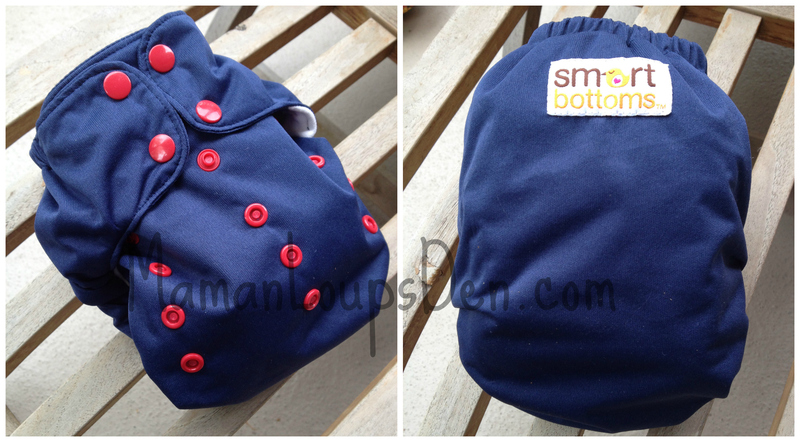 You can easily tuck a booster under the “tongue” for naps and longer outings. I did try adding a TotsBots V4 booster to see if the diaper would hold for us overnight. While we had a leak, it may just be that I didn’t have the fit perfect that night. I think this diaper has the potential to be boosted into an overnight solution. The 100% organic cotton inner is a major selling point for many parents who are looking for the most natural fibers against baby’s skin. Plus, if a baby is sensitive to PUL (the waterproof fabric), there is no exposed PUL to touch baby’s skin on the inside of the diaper. Overall, I would recommend this diaper for parents specifically in the market for a natural-fiber AIO diaper that can really grow with baby and still have the customized absorbency options of other styles. You can purchase your own SmartBottoms 3.1 Organic Cotton AIO via their website. To find out about their Newborn AIO, check out Celeste’s review at Thinking About Cloth Diapers.